← National NOW Conference 2018 Was Full Of Stars! The NCGA leadership planned rare weekend floor sessions to handle two vetoes by Gov. Roy Cooper. Cooper vetoed two bills that alter North Carolina ballot captions for constitutional referenda (taking that job away from the existing Constitutional Amendment Publication Commission) and interfering again in the state Supreme Court race this fall. You can read more at “Cooper quickly vetoes both bills lawmakers passed in special session” at https://www.wral.com/cooper-quickly-vetoes-both-bills-lawmakers-passed-in-special-session/17729364/. And at ABC-11 in “General Assembly plans weekend session to override Cooper vetoes” at http://abc11.com/politics/general-assembly-plans-weekend-session-to-override-cooper-vetoes/3851951/. 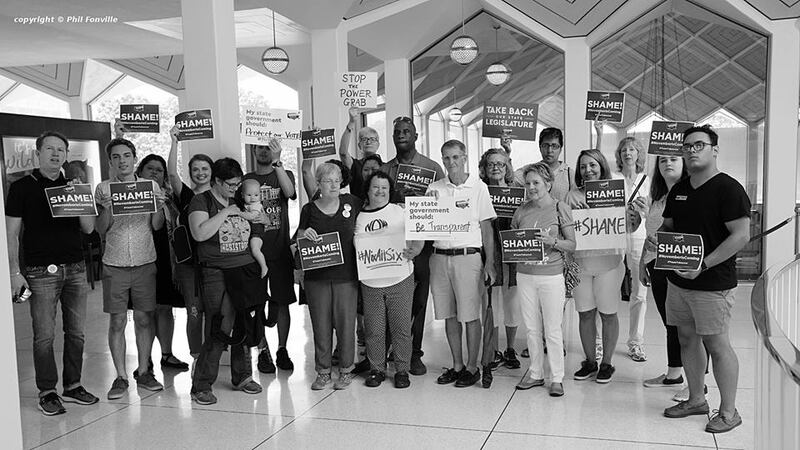 NC’s state legislature – which was elected from unconstitutional racially gerrymandered districts – has mandated that 6 amendments to NC’s state Constitution be on the ballot this November. The “descriptions” of these Amendments from the NCGA are deceiving, and don’t tell the voters what they will ACTUALLY be voting on. The NCGA is opposing all efforts to let the voters know what they would actually be voting on, including not allowing unique and relevant captions on them. Shouldn’t voters have an accurate description of the proposed Amendments before they vote on them? These Amendments would give the NCGA a strangle-hold over North Carolina. “[T]hree former governors are joining Cooper in opposing a constitutional amendment that would give the General Assembly more power at the governor’s expense. ” According to “NC governor doesn’t have much power — and could get weaker: ‘He’d be a nice figurehead’“, 6/28/18, Charlotte Observer. Let’s greet the NCGA as they return to Session to try to override the Governor’s vetoes of their hastily enacted legislation intended to deceive North Carolinians into voting away their rights. Let’s let them know we are tired of their dirty tricks. This entry was posted in constitutional amendment, Courts, Judicial takeover, ncga interference, power grab, press conference, protest, rally, veto, voting and tagged Judicial takeover, ncga interference, power grab, press conference, protest, voting. Bookmark the permalink.